With Model 3 deliveries ramping up this year, you would expect the amount of traffic Teslas contribute to networks around the world would increase. 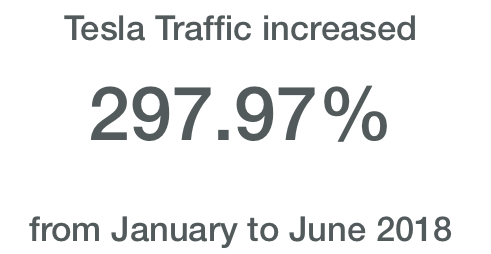 And logic prevails once again — if you compare January to June (the period of this edition of the Phenomena report), the numbers change quite a bit. Not surprisingly, the majority of the traffic from Tesla is in the Americas, but it has a worldwide reach. Now for the big question — what happened from January to June? Bingo, hypothesis confirmed by the data. We'll keep an eye on this one, as it is a good example of translating market success to network impact. Interestingly enough, this is not always the case with some Phenomena data, where subscriber numbers do not always translate to usage on the network — this was most apparent in the music streaming analysis of the full report, but you'll have to wait for that!